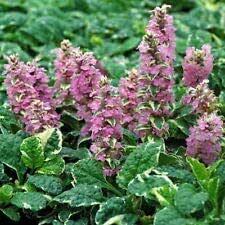 Hardy in zones 5-10 Blooms in the spring Pink flowers Height: 6-10 inches Immediate shipping. Shipped dormant in the winter. Among the most beautiful and useful of groundcovers for sun or shade, Ajuga reptans is a low, spreading evergreen perennial that thrives even in locations shunned by most other plants, such as the poor dry shade beneath trees. Commonly known as Bugleweed, this hale-and-hearty performer is attractive as a species, but ‘Pink Lightning’ adds a whole new dimension to its beauty with variegated foliage and bold blooms. The show begins in mid-spring in most climates, when tall spikes laden on all sides by lavender-pink blooms appear above the foliage. The bugle-shaped blooms that give this plant its common name are profuse, long-lasting, and simply lovely, especially against the backdrop of crinkled mint-green foliage broadly edged in cream. Expect the blooms to last into late spring, transforming otherwise unremarkable garden spots into places of interest.